Well here we are, my first vintage console review and we are starting with what I consider to be the turning point in Console gaming. The sega master system 2 with its compact size,sleek slide back cover and for its time, nifty little controllers that despite being perfectly rectangle seemed to fit nicely into your hands without any real discomfort. 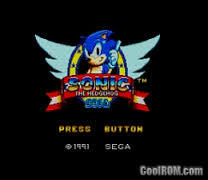 Developed by Sega with a CPU speed 3.55 MHz,Video RAM 16 KB and System RAM 8 KB the console was not the most powerful but paved the way for the future of consoles. 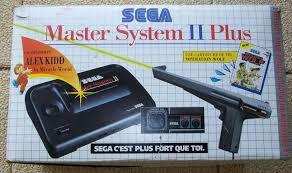 The original Master System was a larger beast with the same processing power and which used a device called a Sega card to play the games, but due to the limited size of these cards they were pushed to one side and made way for cartridges. This amazing little machine was one of the first to come with built in games ranging from Alex kidd in miracle world to Sonic the Hedgehog in the final push of the system. 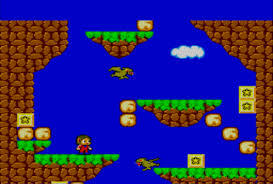 Alex kidd was an amazing little game. It was challenging and my favourite of the built in games with a rather odd boss format of rock,paper,scissors to defeat them. This was made easier by collecting the crystal ball that allowed you to see what the boss was thinking, you’d then choose accordingly. 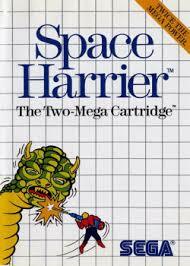 You jumped around colourful little levels punching little dragons and star filled rocks to gather points to add continues, because as in most games of this era saves were rare. I distinctly remember there being a cheat that if you had a certain number of points you could hold a button combination on the joypad and it would add a continue if you had run out, and you had 10 seconds to pull this off. The combo was simply hold the pad up and constantly push A and B. Simple enough you might think, but not for Kris and his pal Jim who for 2 hours were instinctively holding the controller above their heads frantically trying to get this extra continue. 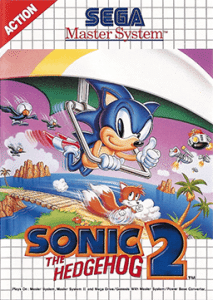 The penny finally dropped with ” maybe it means the D pad?” ( I Kidd you not) the game itself also had some brilliant little vehicles, from a one seater chopper to a mini speedboat, all adding to the variety and addictiveness of such a simple little game. 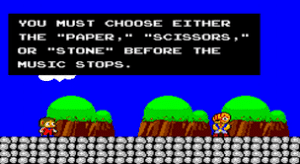 The Master system was also sold in a bundle package which contained Alex Kidd built in, along with Operation Wolf and a light gun this was more than likely done to try to gain ground on the NES system which was dominating at the time. 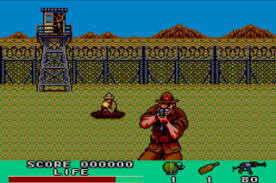 Unfortunately the light gun was a poor affair with shots mainly missing the on-screen targets, resulting in much frustration and name calling. Even putting the gun right up to the screen would still class as a miss! The controller could be used but this was even harder trying to move the reticle around the screen, resulting in many deaths and powering off of consoles before their flight capabilities were tested across the room! 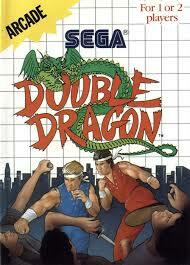 Game development was a major issue with the Master System as Sega only had 2 third party developers in with them – Activision and Parker Brothers. 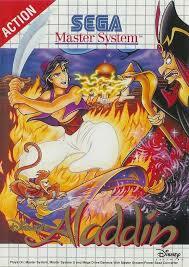 Marketing was also an issue for this little console as it was only being run by 2 men. Believe it or not this was changed by none other than Richard Branson’s Virgin Franchise who took over European distribution. Someone made a brilliant decision to port to Master System Sega’s arcade games which led to interest from other European developers, allowing the console’s game library to grow. 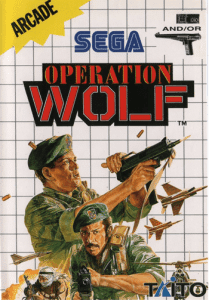 If this had not been done the Master System would have died a sad and lonely death, and who knows it might have even affected the development of the Sega Megadrive. 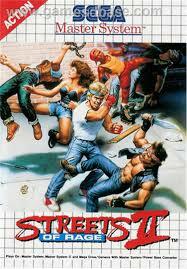 The Master system eventually outsold the Nes in Europe and was helped along with big hitting titles converted for it, the Streets of Rage franchise and Sonic 2 were among some of them. 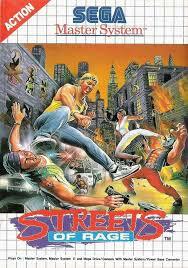 Games continued to be made for the Master System even after the release of the much more powerful Mega Drive and each game got better and better, with developers squeezing the last few bits of power out of this little console that had established itself as a favourite. Platformers had come on leaps and bounds ( yes I am proud of that anecdote lol) and a foundation had been laid for future consoles to build upon without Outrun would there be Forza or Gran Turismo? 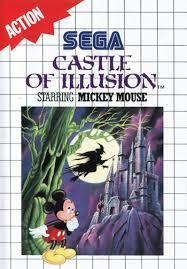 Would Rayman have ever been thought of if Mickey’s Castle of Illusion ever came out? 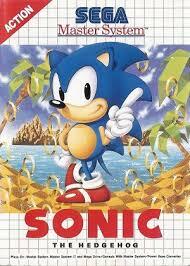 I suppose maybe, but im sure the ideas all spawned from this era of gaming. 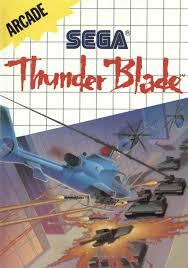 The Master system was eventually put to rest in 1999 so Sega could put all its attention onto the Saturn, it left a legacy of classic games such as Thunder blade and Space Harrier all the way up to Aladdin and had provided hours of fun for youngsters. However times were changing and the little box was now out of its depth and outgunned by larger and more powerful consoles that were producing quality games. The system could never compare to these consoles, so with a tear in our eye we say thank you Master system for your time. We salute you.